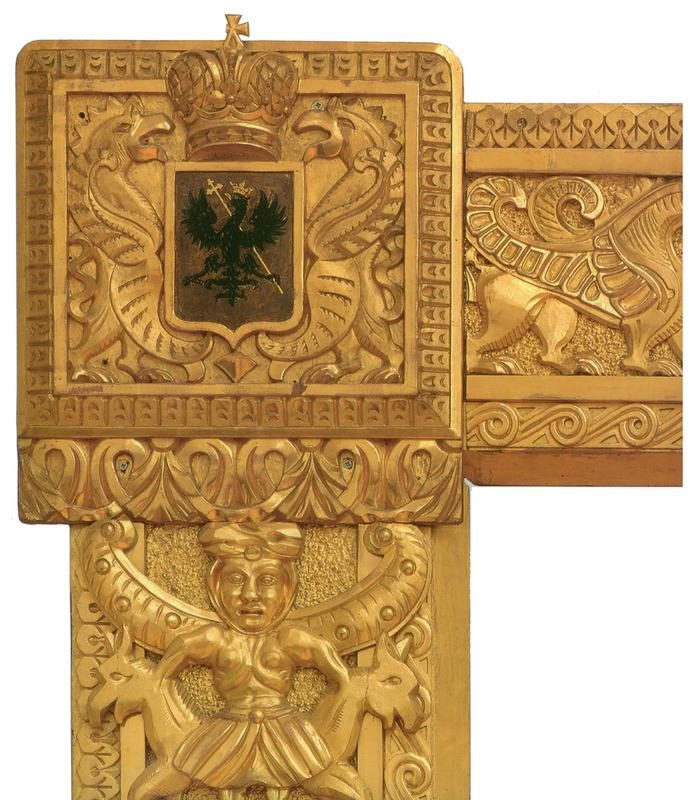 The State Tretyakov Gallery, Moscow, recently hosted the exhibition Precious Framing. The painting and its frame: Dialogues, from 9 September to 3 November 2014; it is reviewed here by Oksana Lysenko, Senior Academic at the State Russian Museum in St Petersburg. This was the second exhibition of picture frames in Russia (the first, The clothing of pictures: Russian frames from the 18th to the 20th century, took place in 2005 in the State Russian Museum, St. Petersburg). 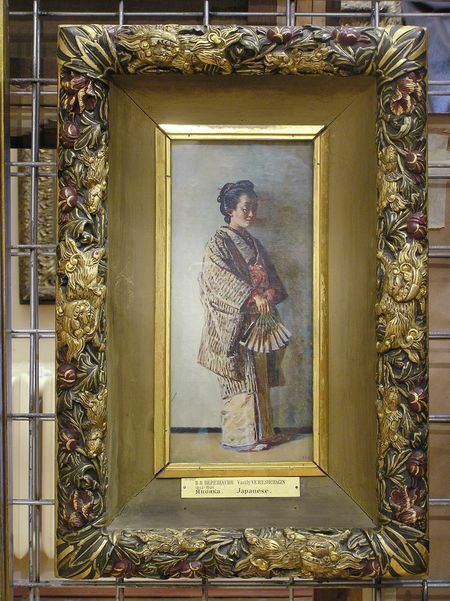 The first exhibition displayed the frame itself as a work of art, focusing attention on features such as its ornamentation and finish, the technique of its manufacture, and its particular style. The purpose of the exhibition in the Tretyakov Gallery, however, was to show the rôle of the frame in the perception of the painting, so most of the exhibits were presented together with the pictures they contain. The exhibition curator, Dr Tatiana Karpova, is a specialist in the history of art, and this aspect is particularly dear to her. Back in the late 1980s, when Dr Karpova was curator of the department of 19th paintings, she realized, as she says, how much the frame means to the work of art as a whole. Later, when she was working on the academic catalogue of the State Tretyakov Gallery, she wanted some of the illustrations to include the frames as well as the paintings, because ‘picture and frame in some cases are one integrated work of art. And if the paintings are reproduced without their frames, some of the information, some important shades of meaning are lost.’ Unfortunately, this idea did not receive any support and was never carried out. The recent exhibition, Precious Framing. 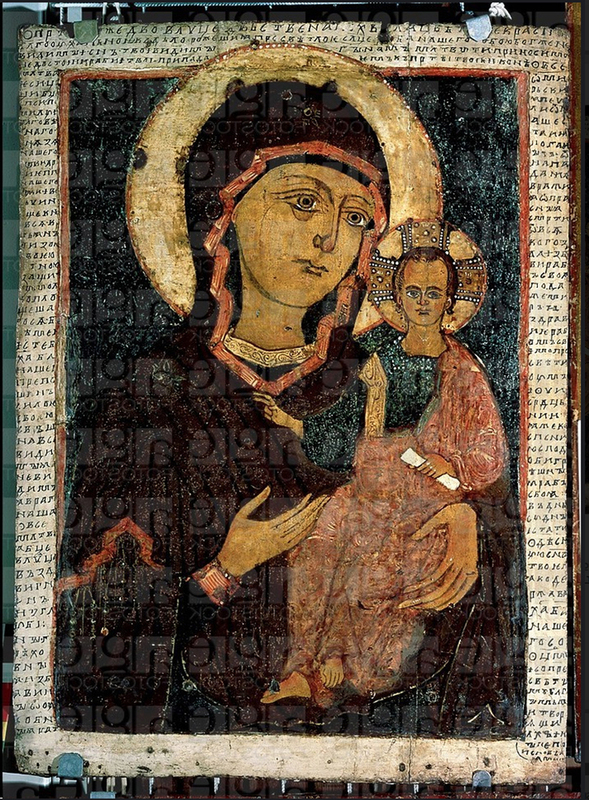 The painting and its frame: Dialogues, included work from the 18th to the 20th century, as well as some early Russian icons such as the Virgin Hodegetria. In mediaeval Russia the only genre of painting was sacred or devotional (in other words, the icon) until the end of the 17th century. The framing of icons consisted of a painted margin (in a different colour from that of the icon itself, and frequently painted with images of the saints or inscriptions, which expand upon the meaning of the icon), a riza (the covering of an icon, usually of metal, and often enamelled, set with precious stones, or decorated with beads) , or the iconostasis (the great carved wooden screen or ‘wall’ which holds a group of icons). Secular works of art – and, above all, portraits – together with moveable frames, appeared in Russia in the last quarter of the 17th century. Unfortunately, frames by Russian craftsmen of that period have not been preserved at all, while only an extremely small number of frames from the first third of the 18th century have survived. Sadly, there are no examples at all from the early 18th century in the collection of the Tretyakov Gallery, so the earliest examples of secular art in the exhibition were two framed works from the middle and last third of the18th century. 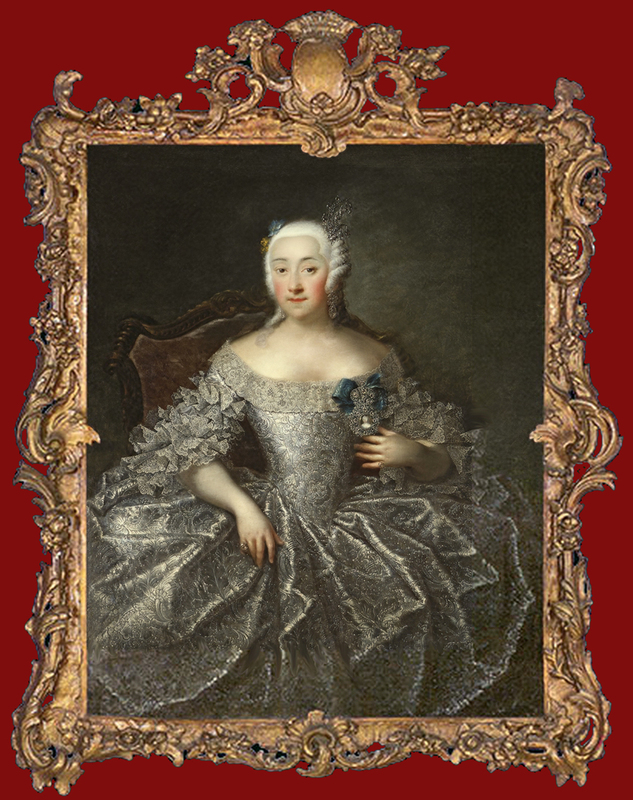 The first was the frame executed for a portrait of the Countess V.A. Sheremeteva by Georg Groot. Unfortunately, in the Soviet period a very low-quality restoration of the frame was carried out (although even the word ‘restoration’ seems inappropriate here), and the gilding was covered with bronze powder in an oil medium. It is therefore impossible today to appreciate fully this work of art – its beautiful carvings hidden beneath layers of coarse renovation. To reveal the original gilding would necessitate a long period of laborious and expensive work; still, I hope that one day we may be able see the frame in its authentic form – even if the 18th century water-gilding is worn (possibly down to the bole or gilder’s clay), since that would only make it more beautiful, and emphasize the beauty of the carving. 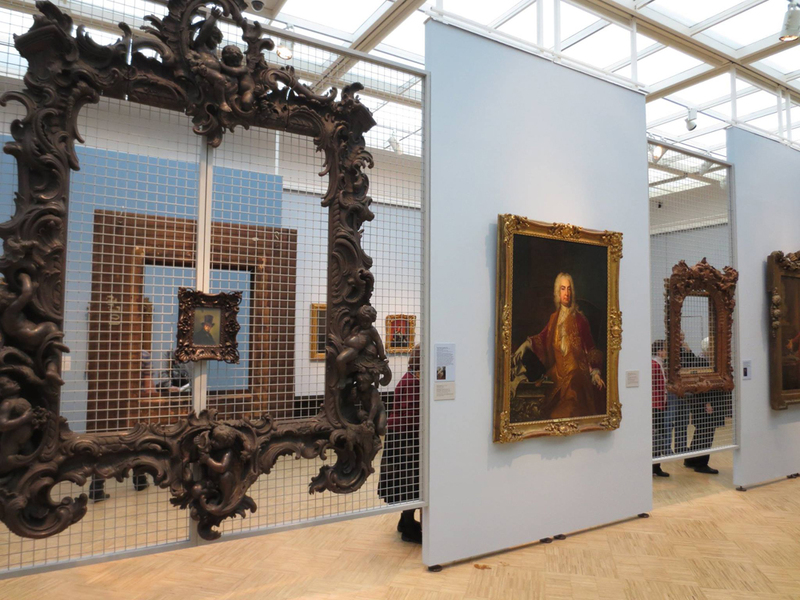 The second 18th century frame in the exhibition was a magnificent example of the NeoClassical style, which became fashionable during the reign of Catherine II. It was apparently created for the portrait of Prince Alexander Golitsyn by Dmitry Levitsky. 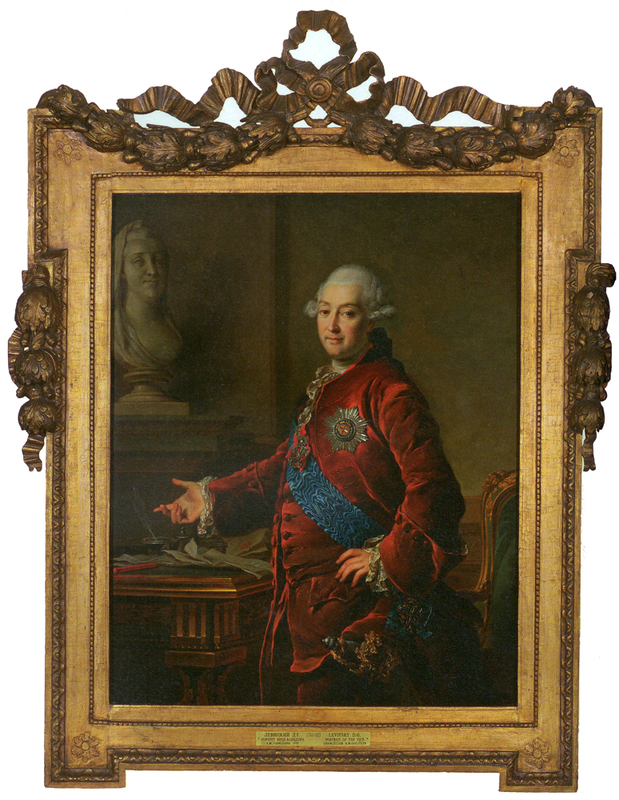 This frame is a unique work of art, and in a rare state of preservation for a Russian frame of the 18th century. It has a characteristic NeoClassical profile, with a wide plain frieze, outset corners, and carved ornament in the form of elegant garlands of bunched oak leaves – which derive originally from French Louis XIII frames – and a bow of ribbon. It is finished in matt and burnished water-gilding on a red bole (in some places there are also repairs in bronze powder bound in oil). 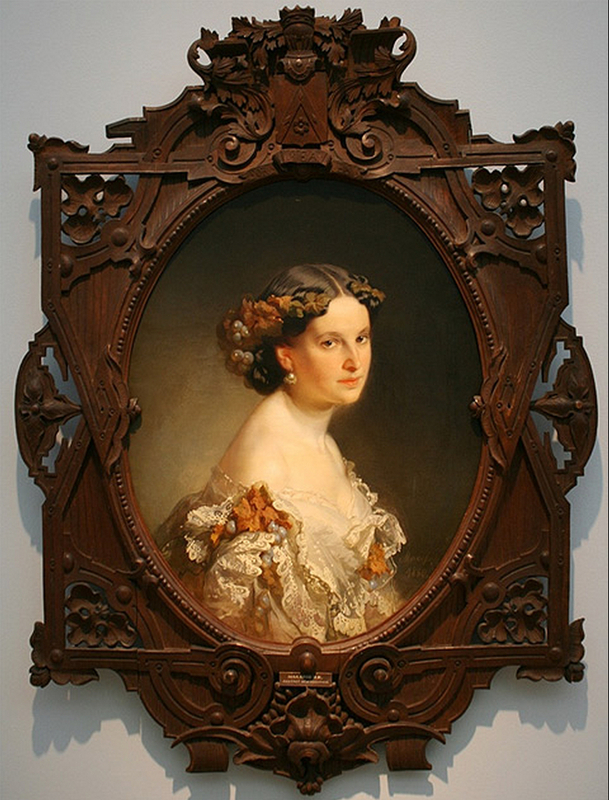 Among the 19th century frames exhibited were both patrons’ frames and artists’ frames, in a variety of techniques and styles. Frames selected by patrons show us the fashion of the era, and the taste of specific people from different social classes. Artists’ frames should be understood in a wider context. When the creator of a work chooses a frame for it, this is not only, or so much, to follow the trends of fashion or a contemporary style of interior decoration: the frame chosen by an artist for his painting shows us rather how he intended it to be seen by spectators, what aspects of the picture he wanted to emphasize, and what he particularly wanted to focus attention on. An artist’s frame is therefore extremely important for the picture it holds. Among the 19th century artists’ frames in this exhibition was the splendid setting of Konstantin Makovsky’s In the artist’s studio of 1881. 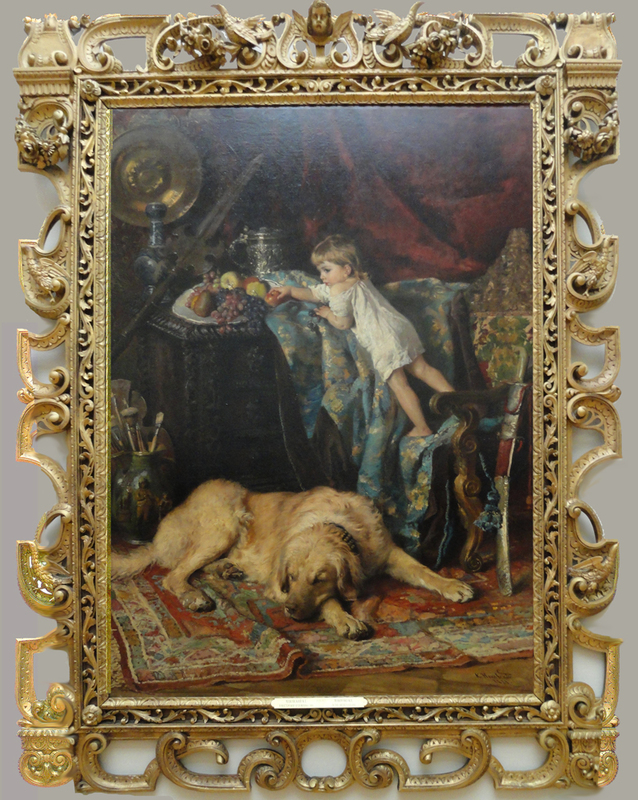 The painting shows Makovsky’s son in an interior decorated with antique furniture and tableware, carpets, weapons, and brocade, and the carved frame both complements and emphasizes this luxurious setting. 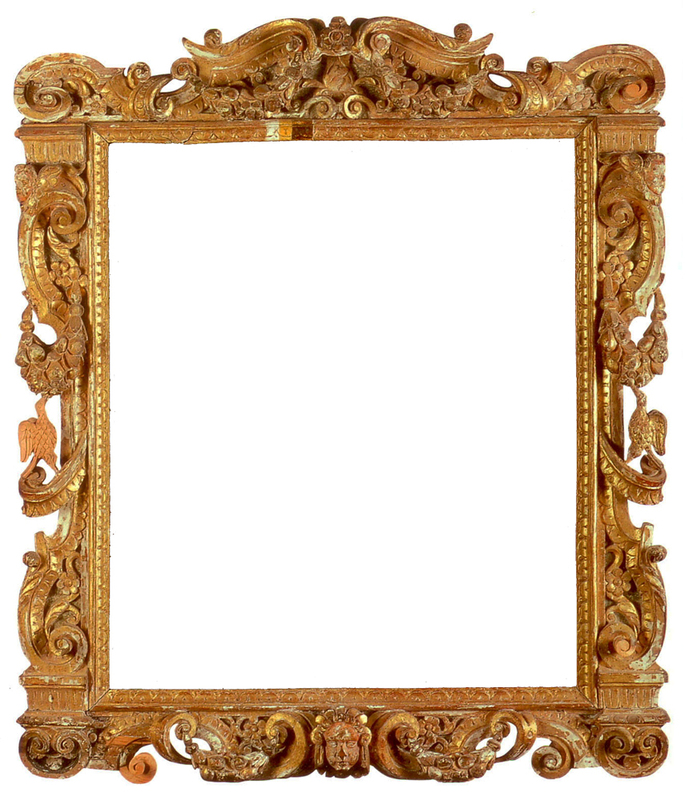 The influence of the Italian ‘Sansovino’ style can clearly be seen in the design of Makovsky’s frame: something like, for instance, this late 16th century example in the collection of the National Gallery, London. 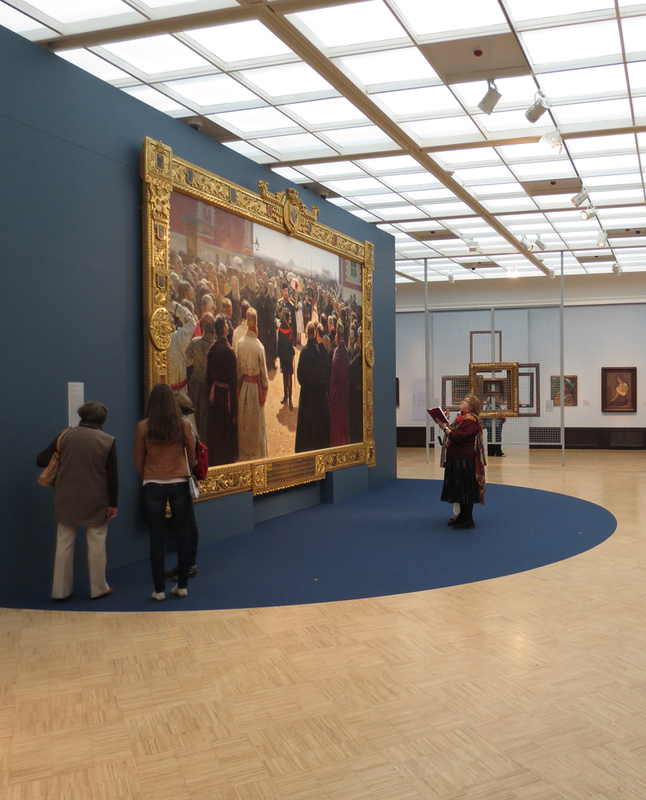 A whole section of the exhibition was dedicated to Vasiliy Vereshchagin and his frames – which is logical, as he paid great attention to the patterns he used for his paintings. Every single frame was either chosen by the artist, or created from his drawings. 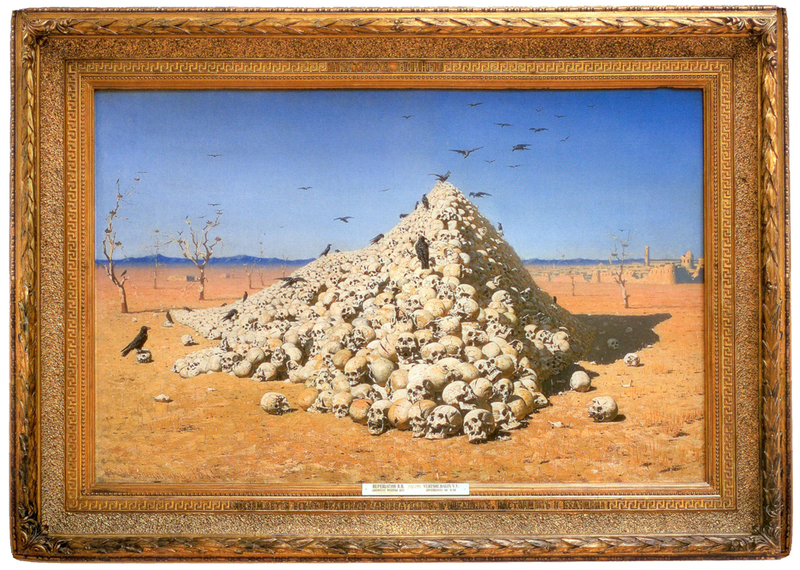 Vereshchagin painted series of pictures, each series being dedicated to a specific topic (there is one on the war of 1812, and a series for Turkestan, one for Russia, and one for Japan); and for each series he designed a specific type of frame, with a carefully-considered profile and ornament. The exhibition, Precious Framing…, was very large, so that the exhibits overflowed the rooms selected for it on two floors of the Engineering Building of the Tretyakov Gallery. Therefore, a number of the frames and paintings remained – although part of the exhibition – hanging in their usual places in the museum’s permanent exhibition, provided with special detailed captions. 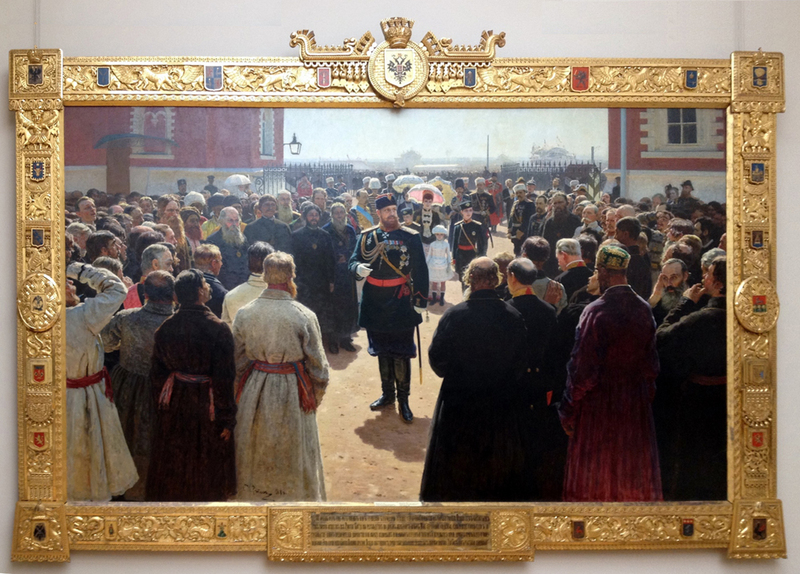 Among the latter works was a painting by Ilya Repin, Emperor Alexander III receiving rural district elders…(1886), in a carved giltwood frame with rich and elaborate ornament, including the small coat of arms of the Russian Empire (at the top centre) and twenty-four coats of arms of the provinces and regions of Russia, as well as zoömorphic and anthropomorphic figures, floral and geometric ornament. 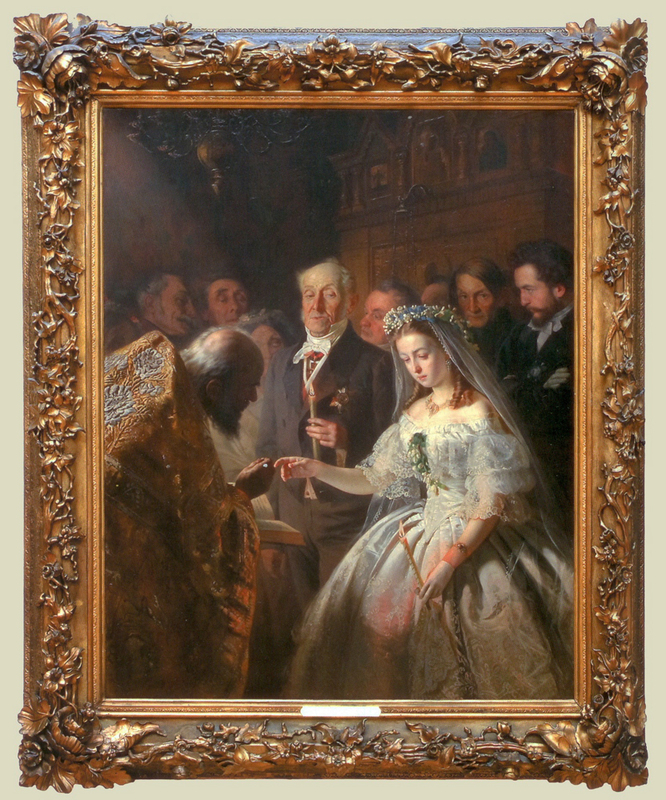 One of the most striking exhibits was a unique frame for Vasiliy Pukirev’s painting, The unequal marriage (1862). This picture is autobiographical, depicting the artist’s mistress who was forced into a marriage of convenience. 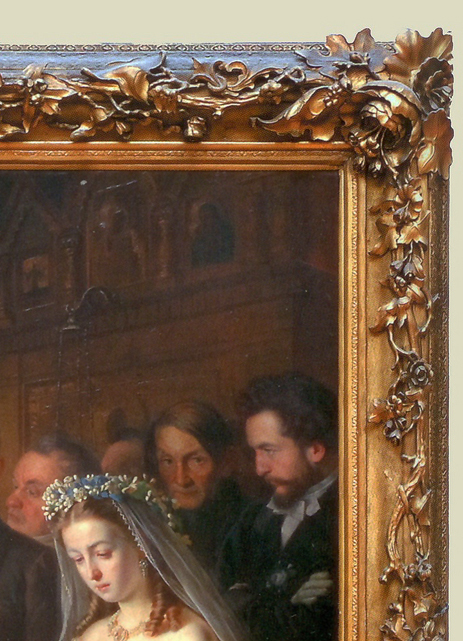 Pukirev painted himself behind the bride (on the extreme right, with arms folded and white gloves), and between the heads of the young bride and the old groom – a rare case! – he also painted a portrait of craftsman Grebensky, the man who executed the frame. Grebensky and Pukirev were friends, and according to the memoirs of N. Mudrogel (who worked in the Gallery under Pavel Tretyakov), ‘…when Pukirev painted this picture, Grebensky decided to make a frame for it’. He carved a garland of bare withered stems intertwined with fresh blooming flowers, so that the theme of unequal union is continued in the decoration of the frame. The 20th century is particularly a time of artists’ frames – the most interesting settings being those designed or chosen by the artists themselves for their works. In the exhibition these frames were displayed in two halls, which covered work from the early 20th to the early 21st century. 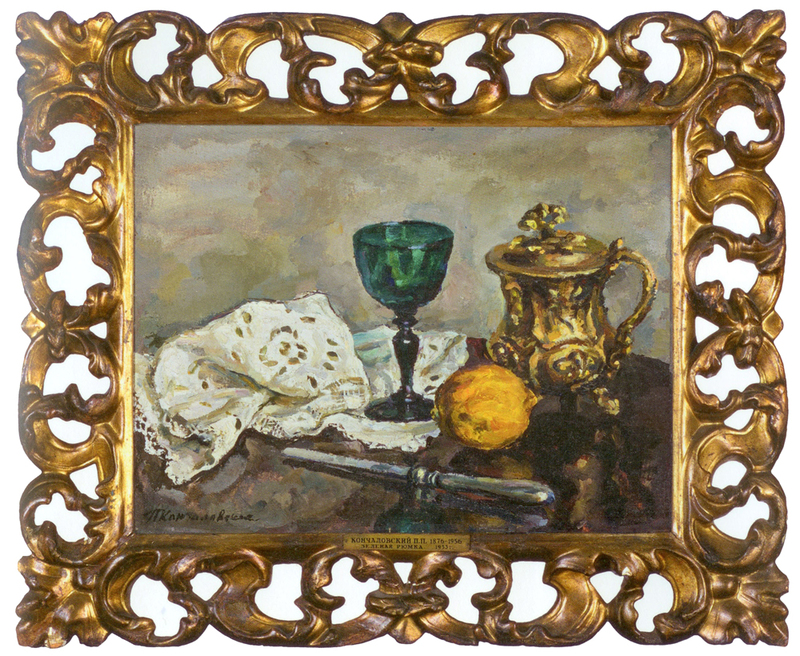 One of the earliest was, for example, Petr Konchalovsky’s still life, The green glass (1933), which was probably painted especially to fit its carved and gilded frame (second half of the 19th century). Picture and frame marry surprisingly harmoniously: the flamboyant pierced floral ornament of the latter echoing the brushwork and impasto of the painting, whilst the play of light on the gilded surface of the frame mirrors the reflections of light on the metal surface of the painted flagon. The bright yellow ochre of this flagon corresponds very closely to the gilding of the frame; and these rich golds emphasize the green glass at the centre of the canvas. Unfortunately, there was only a single example of the work of Russian avant-garde artists in the exhibition: Ivan Klyun’s The running landscape (1913), in its frame made from simple strips of wood. 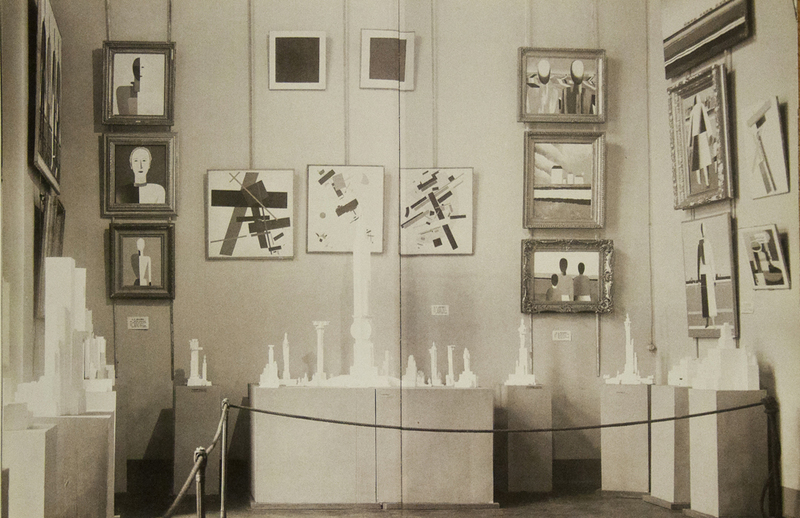 This type of setting is characteristic of works by the Russian avant-garde. 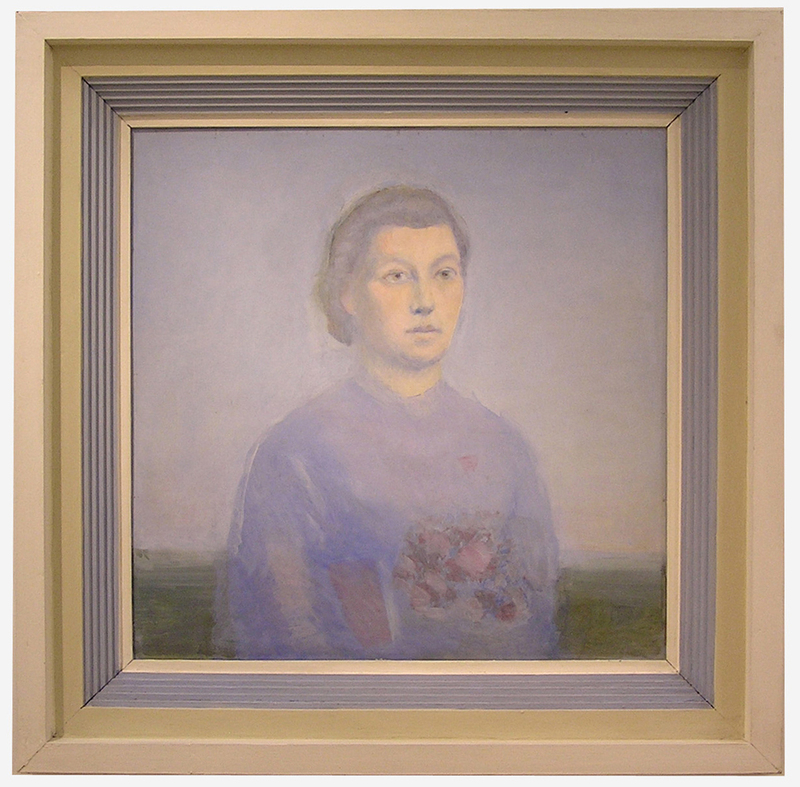 However, this gap was filled in other ways – illustrations of some of them were published in the exhibition catalogue to accompany my article, ‘The 20th century: the era of artists’ frames’: for example, this frame for the portrait of a woman (early 1950s) by Nikolai Suetin, a disciple and follower of Kazimir Malevich. Suetin designed and made the frame himself. This type of frame derives originally from Malevich’s Architecton; its design is based on a combination of vertical and horizontal planes of different widths, in accordance with the principles of proportionality and dynamic equilibrium. Suetin made this particular frame before the picture, perhaps in the 1930s, and the portrait (which is unfinished) was painted to fit it. In order to harmonize painting and frame he toned the latter, in colours identical to and in tune with those of the of portrait. 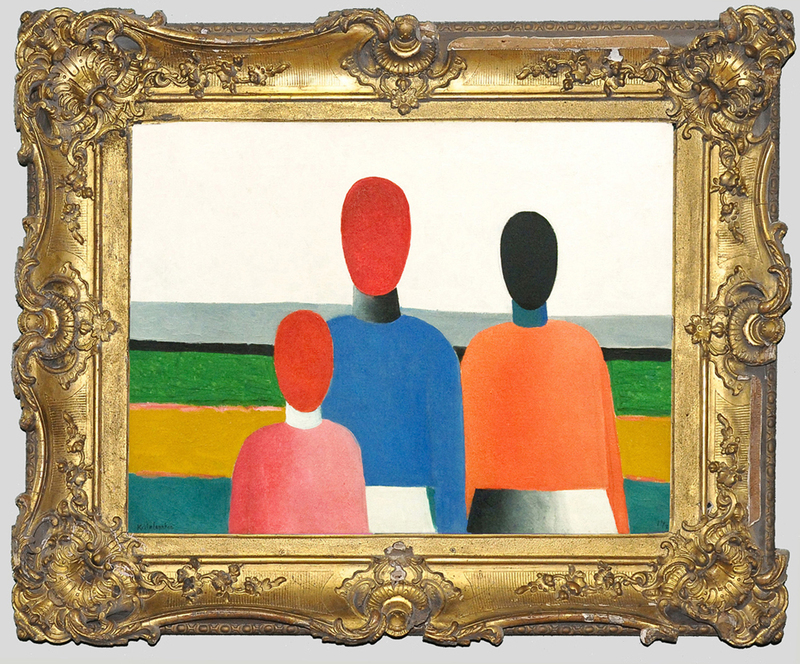 Kazimir Malevich’s own frames are particularly interesting, especially those from 1928-32. Whilst studying his frames I found two original frames chosen by the artist himself, in the collection of the State Russian Museum. One of these, for the painting, Three female figures (early 1930s), even has the artist’s signature on the reverse. From 1928 and into the 1930s, he specifically chose old – generally 19th century – gilded frames with compo ornament for his paintings. 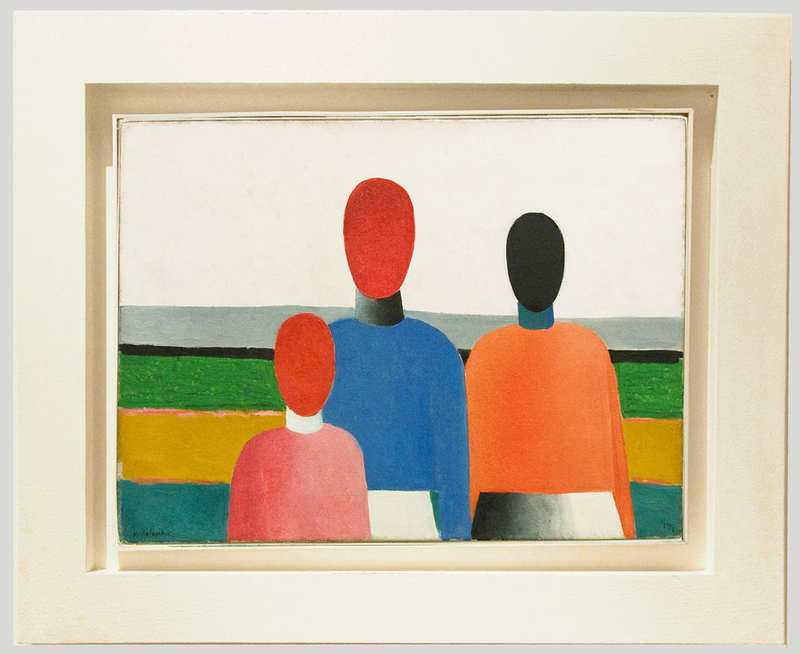 For Malevich the frame was a vital part of the picture, influencing how it was perceived by spectators. Malevich did not use either linear or aerial perspective in his work, unlike artists of the previous centuries; he experimented. In pictures from his Second peasant cycle, Malevich creates perspective through a combination of carefully considered bands of colour (as in Three female figures). And the antique gilt frame, with its hollow profile, emphasizes this complex perspectival recession created by the artist. When Malevich’s paintings from 1928-32 are exhibited today in modern baguette or shadow frames (as they are, unfortunately, in the State Russian Museum, which possesses the largest collection of works by Malevich), it distorts the artist’s intentions. The State Tretyakov Gallery must have some of Malevich’s frames in its collection, since several of his late works came to the museum in his lifetime, together with their frames. During the Soviet period pictures and frames became separated, and 19th century paintings may have been inserted into Malevich’s frames. I hope that, over time, his pictures from 1928 to 1932 – both in the State Russian Museum and the Tretyakov Gallery – will be reunited with the artist’s frames or their analogues (which it would be possible to select on the basis of old photos, like the one above), and then Malevich’s intentions will be fulfilled. Whilst the exhibition, Precious frames…, was in preparation, many of the frames included underwent restoration. 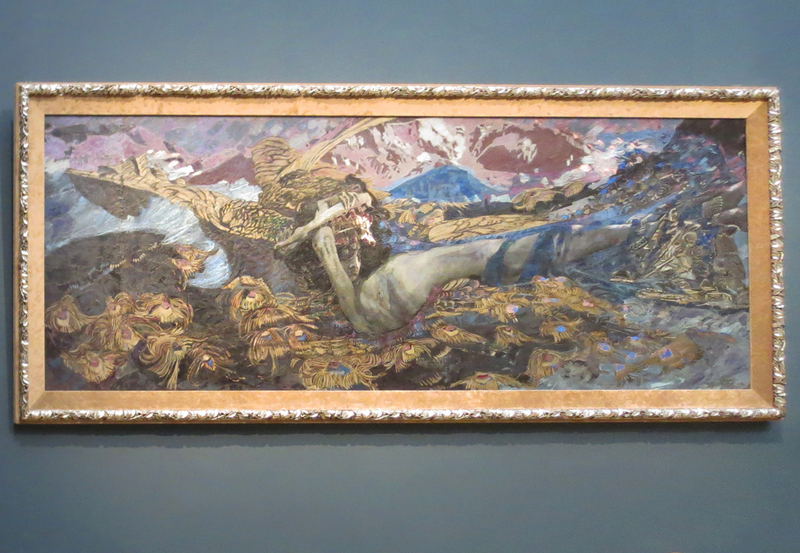 That of the frame of Michael Vrubel’s Demon defeated (1902) was especially interesting. This particular artist’s frame is decorated with velvet, and with gypsum ornament in the form of a garland of laurel leaves, intertwined with ribbons and finished with silver leaf. Over time, the velvet had faded, so the conservators removed it and found a small piece which preserved the original colour. This was used to match a contemporary velvet, with which the frame was covered. As a result, picture and frame now once more form a single whole. 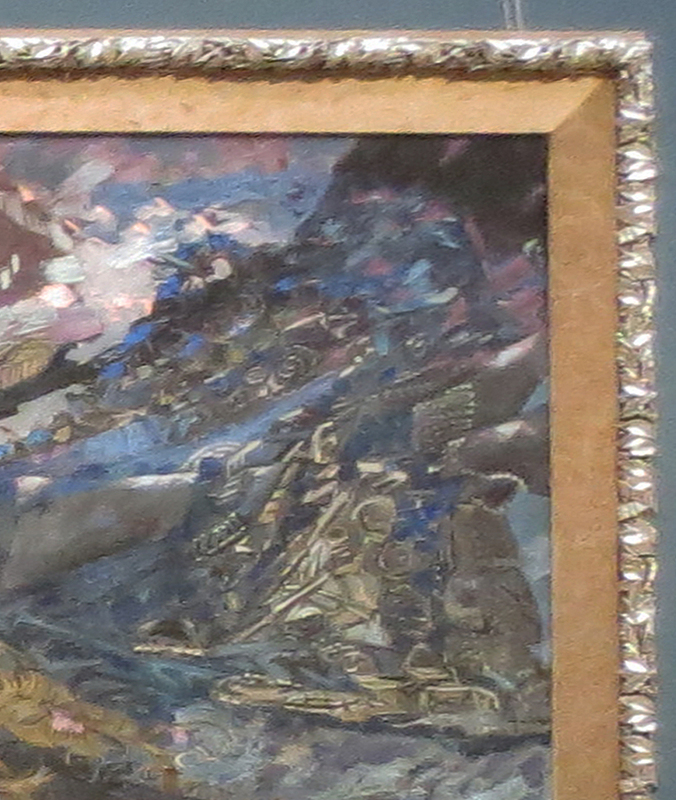 The colour of the velvet combines harmoniously with the colours in the painting, whilst the cool highlights on the silvered ornament of the top edge of the frame have something in common with Vrubel’s characteristic bright and succulent brushstrokes on the canvas. In conclusion it should be noted that, from 20-21 November 2014, the Tretyakov Gallery held the first scientific conference in Russia dedicated to picture frames, The frame as a piece of art; and that this was held in the context of the exhibition Precious frames… Most of the participants in the conference were experts in the visual arts, and – by their own admission – the conference was the reason that they discussed the idea of the frame. We may say, without exaggeration, that both the conference and the exhibition provided significant contributions to research on the history of picture frames in Russia. With regard to the papers delivered at the conference, the Tretyakov Gallery is planning to publish them as a collection of articles in Russian; the Tretyakov Gallery has also published the catalogue, The painting and its frame: Dialogues, in Russian. Oksana Lysenko is a senior member of the academic staff of the State Russian Museum, St Petersberg, where she has worked since 1995. 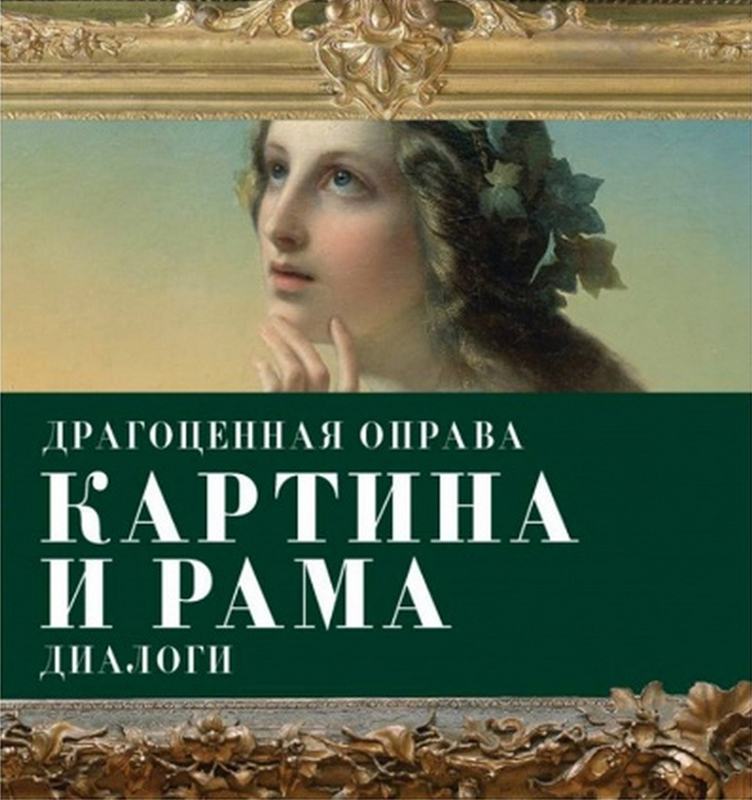 She organized the exhibition, The clothing of pictures: Russian frames from the 18th to the 20th century (2005, State Russian Museum), and produced the accompanying catalogue. With grateful thanks to Oksana for this review, and for her patience in the editing process; and to the State Tretyakov Gallery, Moscow, for all the images used in this article. I just received the catalogue … Thanks a lot once again. Looks interestingly and intriguingly…. I’m so glad that you were able to get hold of a copy, and I hope that you enjoy it. Thank you very much for prompt answer.